Spring is nearly here and the tulips are starting to appear in the store. The creative part of my brain has been active lately so I picked up these charming yellow tulips to not only enjoy but to also play with. Setting these onto my newly acquired Lightpad by Artograph I selected three of them and laid them next to each other. Using my Canon 5D Mark IV with the 100mm macro lens attached, I also added a Neewer Ring Flash that I held above the lens to illuminate the top sides of the tulips. Bringing the image into Lightroom for some minor edits, I then brought the image into Photoshop to begin enhancing the image. 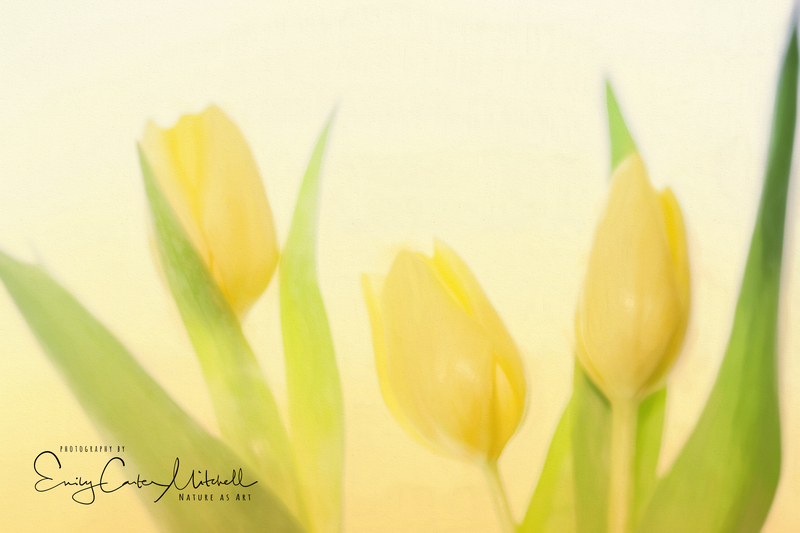 With a yellow texture that I created one morning at sunrise, I added the background with the multiply option and then brushed details of the flower back in with the brush. Flattening the layers, I then transferred the image to Topaz Impressions where I added the painterly effect at a reduced opacity. This has now inspired me to find more yellow flowers to create a color themed floral gallery. You are so very kind Herb – I just haven’t been chasing the animals and birds that much lately. I’m being pickier about the light and the conditions that I’ll take their pictures. I’ve been following two digital artists specifically – Denise Ippolito and Kathleen Clemons. They are inspiring my inner artist with flowers and plants which I’ve always enjoyed as well. They lend themselves better to artistic renditions than birds and are more marketable. But don’t worry..I’m going to be shooting lots of critters very soon. Thank you so much Herb. They’re hard to resist. Mine are still looking quite lovely. Thank you Fatima ! Me too ! We should do something with it ya think? Print for you??? Valentine’s coming up: it should be a winner!